Regarding supervised Re-ID, we present a common subspace learning method, which we coined Kernel PLS Mode A, and a cross-view discriminative regression model, X-KPLS. 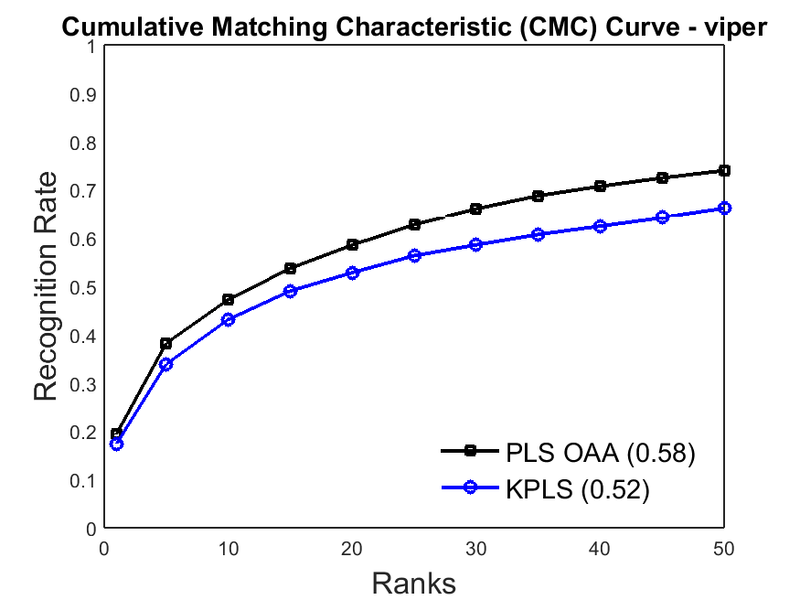 Experimental results demonstrate that both methods are sucessful for person Re-ID with results comparable to the best performing methods in literature. X-KPLS has a better recognition rate, but it depends on the number of subjects. Differently, Kernel PLS Mode A works in a latent subspace of reduced dimensionality and can be employed in real world scenarios. In the unsupervised Re-ID problem, we show that Kernel PLS (a nonlinear regression model) presents outperforming results in PRID450S. For instance, we obtained ~41.5% for rank-1, while the best performing method in literature reaches ~39.5%. In the following, we present these results and a link to download our code. This code obtained the following results in the VIPeR and the PRID450S datasets. We used a common procedure in literature to achieve more stable results in VIPeR and PRID450S which consists in randomly partitioning the dataset in training and testing subsets of equal sizes (these partitions are available with the code). In the testing subset, images from one camera are considered as gallery and images from the other camera are considered as probe. 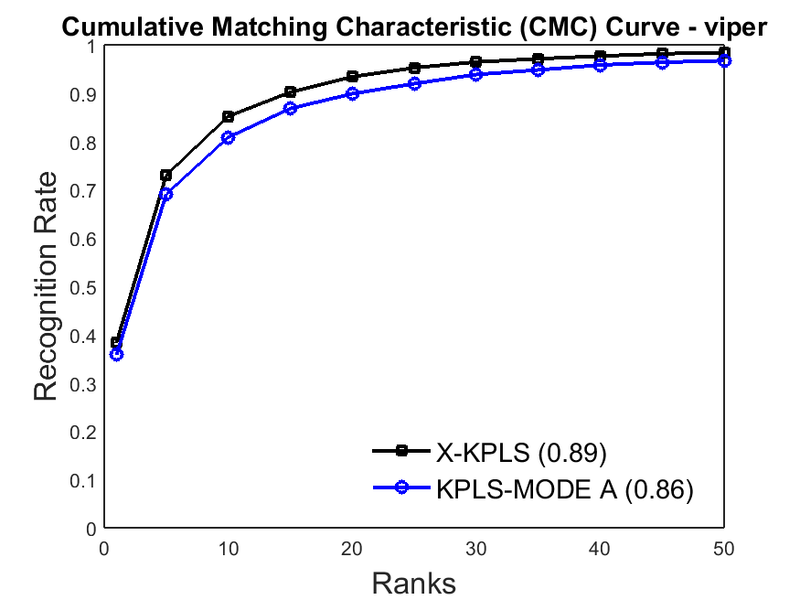 The results are reported using Cumulated Matching Characteristic (CMC) curves showing the average of results obtained from 10 trials. 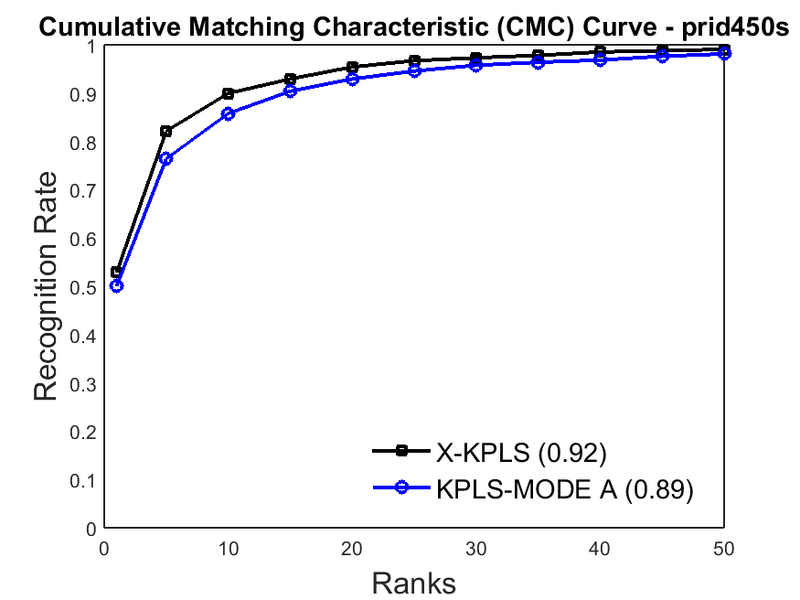 The following CMC curves presents the results for PRID450S (first row) and VIPER (second row) using unsupervised (first column) and unsupervised (second column) protocols. * Notice that the reported results are different from those presented in the paper (Tables from 1 to 4). It occurred because only recently we tested with a different feature descriptor (CNN features for VIPER, descibed in reference  from the paper) obtaining better results. To obtain the results reported in the original paper, you should use the feature descriptor as described there. 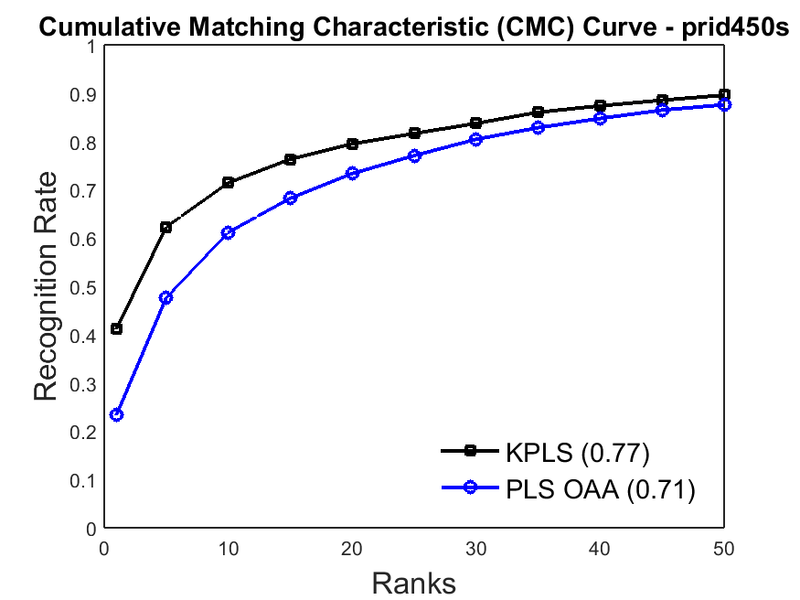 Prates, Raphael; Oliveira, Marina; Schwartz, William Robson (2016): Kernel Partial Least Squares for Person Re-Identification. In: IEEE International Conference on Advanced Video and Signal-Based Surveillance (AVSS), 2016.